The famous comedian and TV personality Steve Harvey and his current wife Marjorie Elaine Harvey celebrated 10 years of marriage early in the month of June this year. The gorgeous couple got married back in 2007. In addition to their married life, the power couple is blessed with seven children altogether. After a series of unsuccessful relationships both the couple finally found each other in the form of soulmates. Let's find out the secret behind their blessed relationship in today's section. Marjorie is living a happy family life with her current husband Steve Harvey. They attend a number TV shows together and appear as the perfect couple since they tied knots back in 2007. 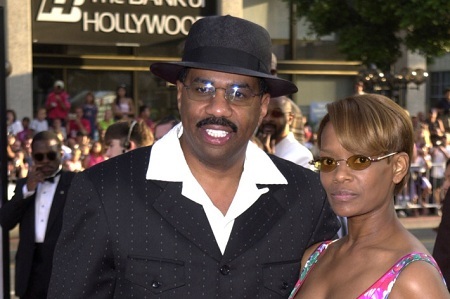 Marjorie is Harvey's third wife. He was married to his first wife Marcia Harvey between 1980 and 1994 and later to Mary Shackelford from 1996 to 2005. Marjorie and Steve got married on 25 June 2007 in a star-studded ceremony in a romantic destination, Maui. They have been blessed with a daughter named Lori Harvey. She has three other kids Morgan, Jason, and Karli from her previous marriages. "For as long as I can remember I’ve always loved putting together great looks that combine beautiful colors and lavish textures in a captivating way. Anyone who knew me in high school or in my early years often says they are not surprised by my present endeavors, namely my blog, The Lady Loves Couture." She is often invited to the Paris and Milan's Fashion Weeks. Altogether, Steve is blessed with seven kids-twin daughters Brandi and Karli and a son from his first marriage and a son named Wynton from his second marriage. The lovely pair celebrated 10-year- marriage anniversary on a romantic vacation. They enjoyed the quality moment on a yacht. The lovebirds even shared their happiness via Instagram along with a heartfelt message to his beautiful bride. "God knew 10 years ago exactly what I needed and I’m so glad I listened… Happy anniversary baby @marjorie_harvey." Well, Marjorie and Steve are truely a blessed couple. We wish them lifetime of happiness and best wishes for their forthcoming. It's been more than 10 years since Steve divorced his ex-wife Mary Shackelford in 2005. And now she sued her former husband for $60 million in May this year. The comedian's ex claimed that her life has been very complicated since the divorce. She mentioned a lengthy list of things that included child endangerment, torture, conspiracy against rights, emotional distress, and even 'soul murder'. "Steve Harvey owes me $50 million and I want him arrested for violating my civil rights. I want him charged with a constitutional rights violation, falsifying documents, perjury, contempt of court, embezzlement, extortion, and collusion. For what he's done to me, I want to see Steve Harvey behind bars." As per the TMZ, Mary's main point for the lawsuit is emotional and physical trauma after 'losing her son, businesses and the joy of celebrating a Mother's day'. Steve and Mary were married for 16 years. After divorcing in 2005, they have been involved in various legal proceedings regarding the custody of their only son. Born on 17 January 1957 in Welch, West Virginia to the family of Jesse Harvey and Eloise Vera. Completed his graduation from Glenville High School in 1974. Also attended Kent State University and West Virginia University. He's been an insurance salesman, a carpet cleaner, a mailman, a boxer, and an autoworker. 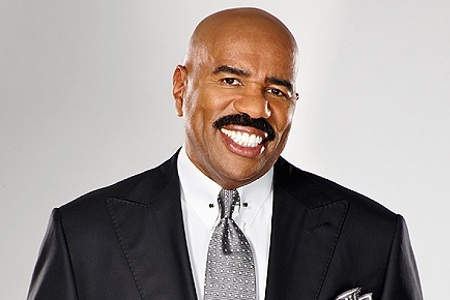 Best known as the host of The Steve Harvey Morning Show, the Steve talk show, Family Feud, and Little Big Shots: Forever Young. He is the five-time Daytime Emmy Award winner and 14-time NAACP Image Award winner. Recently, he hosted the Miss Universe 2017 pageant in Las Vegas. He has an estimated net worth of about $120 million as of 2017.